If a student has been enrolled with a future start date, the future date details can be seen via the Family Summary tab and via the Student Classes tab. 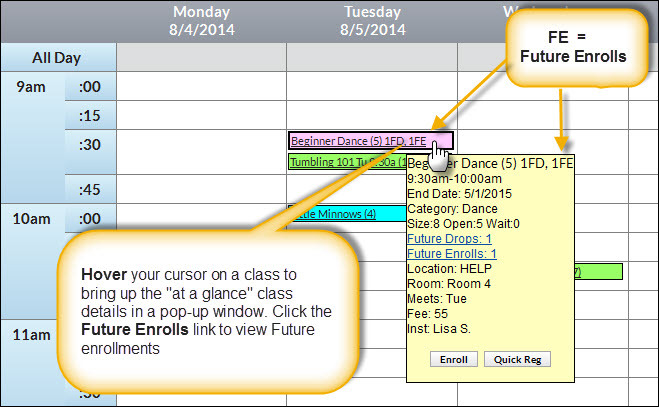 Future Enrollment information can also be viewed via the Class View as well. Click the Weekly Calendar button on the Executive Dashboard or point to Classes and click Weekly/Daily Schedule. 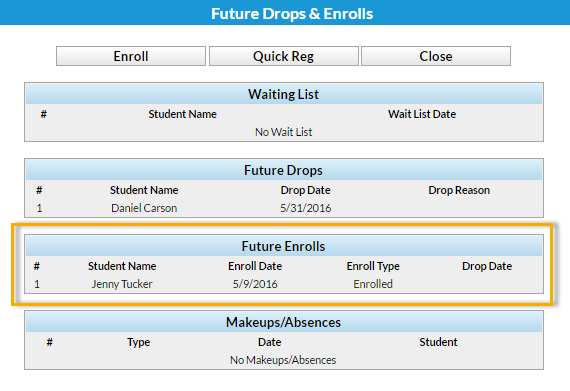 If Future Enrolls are present for a class, two acronyms are present along with the class name: FE = Future Enrolls and FD = Future Drops. Hover your cursor over the class name and a small window with class details appears. Click on Future Enrolls or Future Drops to view details.